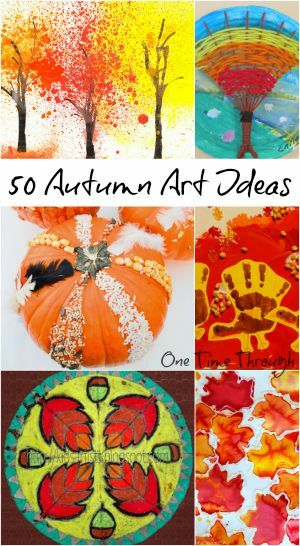 Whether you are a parent, teacher or caregiver looking for ideas for art for your kids – you are guaranteed to find some awesome fall project ideas here that will inspire your future Picassos! I’ve chosen to feature ideas that are open-ended and focused on the process of creating because to me, that’s what art is truly all about – the experience. These ideas are all colourful and stimulating, and as a bonus – most of them require only a few supplies. At the bottom of my list of 50 fall projects, you will find a linky to other fall-themed roundup posts by my fellow bloggers from the KBN. Be prepared for the kids to get messy with these wonderful painting projects that use brushes and fingers…puffy paint, watercolours, and acrylics and more! Kids can learn about patterns and the elements of design by making prints. This collection of ideas includes several ideas for homemade stamps as well as investigations of textures of different fall objects. Homemade Leaf Stamps | Mama. Papa. Bubba. This section includes ideas that bring art into the 3rd dimension – perfect for kids who like to build. I can’t wait to try the gorgeous paper tree sculptures, and you definitely have to check out the weaving project for kids 8+. And remember – kids of all ages like playdough – be sure to check out my textured and scented playdough ideas for truly process art moments! Some of these projects are the simplest to prepare, only requiring paper and coloured pencils. Others involve “drawing” with materials that are not typical – but sure to catch your kids’ fancy! By putting different elements together to create art, kids have to look closely at objects and textures and patterns. They are using their creativity to piece together parts into a pleasing whole. Make sure you’ve got lots of glue for these projects! Leaf Rubbing Collages | Mama. Papa. Bubba. That’s it for my awesome collection of Autumn art activities for kids. I hope you have found the inspiration you were looking for. I can’t wait to try some of these projects with Onetime and my students this fall! And remember – check out the other fall posts in the linky below. What a wonderful assortment of autumn crafts. It will be hard to decide which one to try first. Thanks Shelah! I think your sensory leaves art is such a neat project. Just waiting for the leaves to turn colours now…LOL! So many fun and cute fall craft ideas all in one spot. 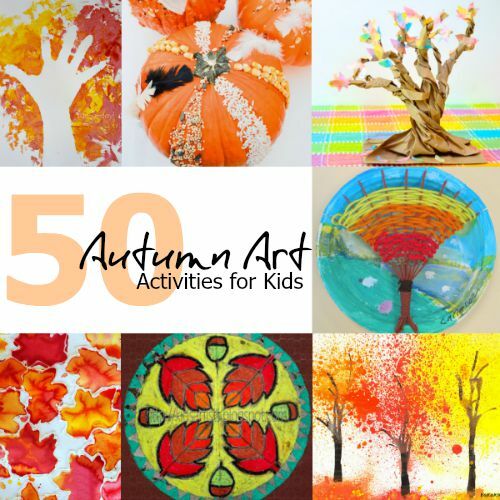 Thank you for including our Q-Tip painting fall trees in the list. Thanks for dropping by Christina! Love all these great ideas and can’t wait to use some in my preschool class! Glad you liked the list Linda. I know I’m going to come back to this list over and over again too. Good luck with the contest! I’m so happy I found this site. Great ideas. I have so many favorite Fall activities. My two favorites are going to a local orchard to pick apples and taking a hayride out to the pumpkin patch at a park near our house. This year though, I plsn in having a s’mores night in the neighborhood using a couple of fire pits. I’m right with you on the apple picking and pumpkin patch trips – so much fun! S’mores with the neighbourhood sounds like such a fun idea! Good luck with the contest and I’m glad you found my site! My favorite activity is going to the pumpkin patch and finding the best pumpkin, then going home and carving with the kids. We all have the best time. Perfection. Such a classic, fun activity. I never tire of it either! Good luck with the contest! Thanks so much for dropping by Emma! Glad you could be a part of this fun roundup! These ideas will be so fun to try this fall! I will bookmark and save so I can refer to this post. Pinned, tweeted, too. Thank you. Thanks for dropping by Carolyn! Happy Autumn!